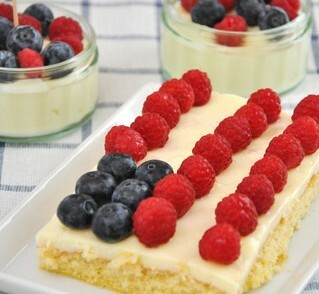 Our gorgeous, festive cake makes the perfect Fourth of July dessert! In a large bowl, whisk the eggs, sugar, oil, yogurt, milk and vanilla. Stir the dry ingredients into the wet ingredients with a spatula, until just combined. Pour the batter into the prepared pan and bake for 25-30 minutes, or until a toothpick inserted in the center comes out clean. Allow to cool completely before frosting. To make the frosting: With a handheld electric whisk, beat together the butter and cream cheese. Slowly add the vanilla and powdered sugar. 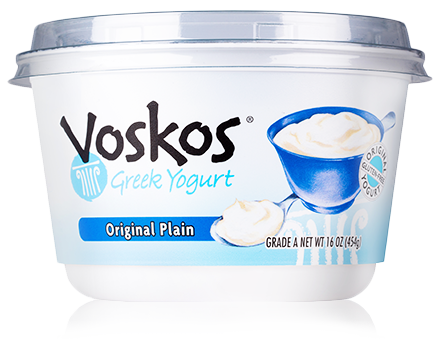 Beat on medium speed until creamy, about 2 minutes, scraping down the sides of the bowl with a spatula as necessary. Use a spatula to evenly frost the top of the cake. Topping: Arrange the fruit on top of the frosting as shown in the photo. Happy Fourth of July!